San Francisco running back Frank Gore is stood up at the line of scrimmage by Seattle tackle Colin Cole in first half action. Renton - Early against San Francisco in the season opener, running back Frank Gore bounced outside and broke free with nothing but daylight between him and the end zone. Gore was headed for a sure touchdown before Seattle Seahawks defensive tackle Colin Cole swooped up the Niners’ running back, holding him to a 6-yard gain instead. 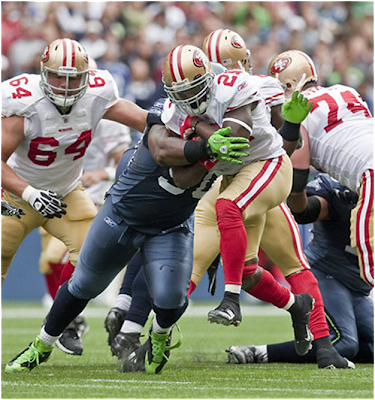 The play was an example of the new freedom Cole has been given in Seattle’s 3-4 hybrid scheme, resulting in higher productivity for the 6-foot-2, 330-pound former nose guard brought in before the 2009 season to help the Seahawks’ run defense. Cole is tied for sixth on the team with 11 tackles, and has a pass deflection. He said the team has shifted him from a penetrating nose guard playing in the gap to a two-gap player head up on the center, allowing him to read the running plays and move to the ball to make a tackle. Cole’s change in focus was part of Seahawks coach Pete Carroll’s emphasis on getting bigger inside to stop the run and force offenses into third-and-long passing situations. Seattle was solid against the run last season, finishing 15th overall (98 yards a game). But the Seahawks have raised their level of play in 2010, and are fifth overall against the rush (67.7 yards per game). Along with Cole, Brandon Mebane has been a force inside. But the Cal product has been limited this week with a calf injury and might not be available today. So it will be important for the Seahawks to lean on their depth inside.